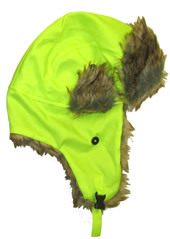 Lime winter trooper hat. Two ply. Faux fur lining, front and ear flaps. Ear flaps can be worn down or fastened with velcro to top of hat. Provides protection from cold weather. One size fits most.